Although e-scooters have exploded in popularity, many still don’t understand what they are or how they work. If you want your boss to get behind you and offer you space for a scooter, then show them. Bring your scooter into the office, explain how portable and lightweight it is and put across your passion – they should quickly get behind it and offer up a cupboard! E-scooters are not only better for the environment, but they’re good for your health, too. It’s a myth that e-scooters don’t require physical exercise. Sure, you can power up a scooter and take it easy when you’re riding through town, but you’ll still need to use your legs to absorb shocks from the ground, and your arms to stay balanced. If your boss knows you’re going to be more alert and productive, then they’ll naturally want to support your e-scooter decision. Another way to persuade your boss to give you some room in the office is to forfeit a parking bay. Making the jump from car to e-scooter can be tough, so weigh up the pros and cons and remember that you may not always want to ride your Zero X10, especially if it’s raining. Use this as a last resort and think twice before you sign over your parking spot to someone else! If your boss is happy for you to park your scooter in the office, offer to create a bay or make room in your own time. Stay back at the end of your shift to clear out an unused cupboard for your scooter, create an area behind reception where you can charge your scooter, and find a spot where your scooter won’t get in the way so that your manager doesn’t change his mind. Finally, show them that giving you space for your e-scooter was the right decision. Arrive at the office a couple of minutes early, tell your colleagues that you’re enjoying riding to work, and get other people involved in the action. You could offer an e-scooter demonstration in your lunch breaks, or post your scooter on social media to show customers that you’re a fun, energetic and dynamic bunch. Who knows? You might create another e-scooter convert! Scooting to work offers numerous benefits to your health, stress levels, and the environment, so give it a go and let us know how you get on. If you’re looking for an upgrade this year, or you want to treat yourself to some accessories, like a travel bag or shopping basket, you’ll find it all right here on the Personal Electric Transport website. Click here to start shopping. 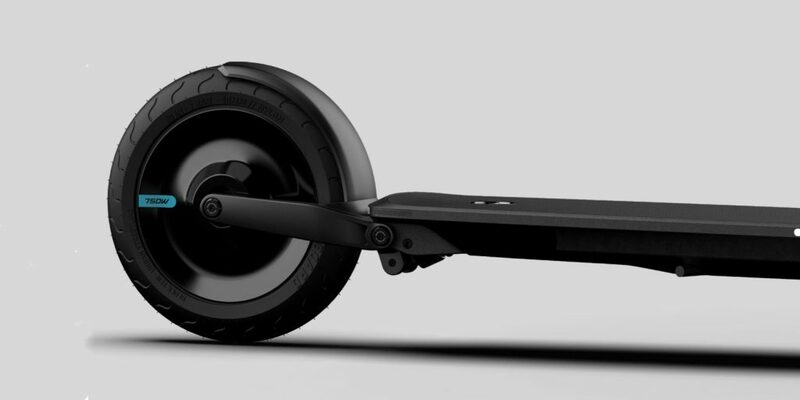 Inboard Technology, the creator of the best-selling M1 Electric Skateboard, recently announced its newest product, the Glide Electric Scooter Inboard recently raised $8 million in Series A funding to develop pioneering urban transportation solutions. 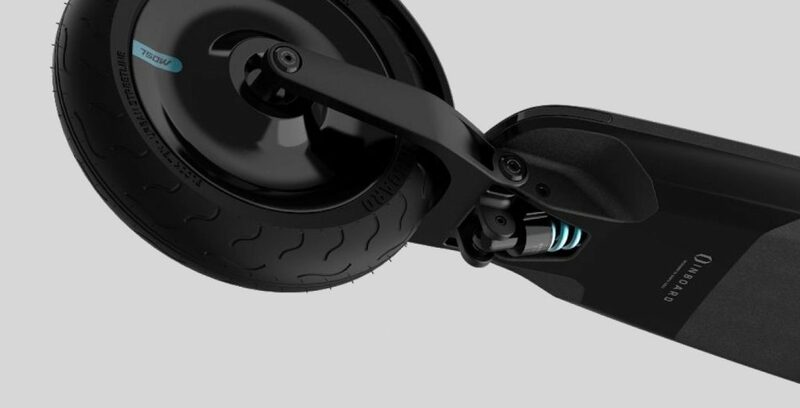 The Glide Electric Scooter will be the most technologically advanced electric scooter on the market, featuring regenerative braking, a swappable battery, pneumatic tires, a headlight and rear brake lights. The Glide’s wide makes it easy to ride, and the foldable design make it convenient to carry and store also the Inboard’s phone app allows for wireless firmware updates. The Glider was specifically designed to improve upon the shortcomings of the most popular electric scooters on the market, such as the Xiaomi M365 scooter used by companies like Bird and Lime. 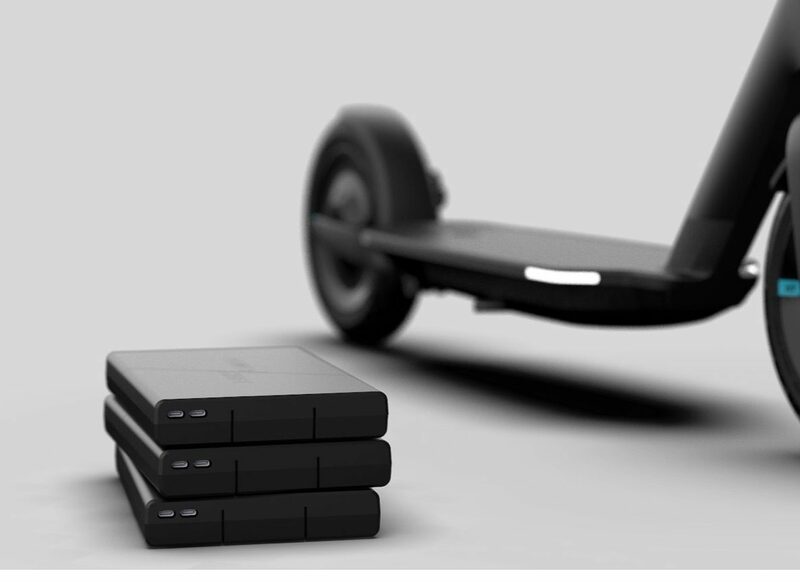 The Glider is one of the few electric scooters that allows user-swappable battery packs. Each battery should be good for 12 miles (20 km) of range. It also sports a higher power 750W motor, which should help it conquer hills that have stalled out scooters from other manufacturers which are usually rated for just 250 W. On flat ground, the motor is enough to reach speeds of 18-20 mph (29-32 km/h) It is a suitable scooter for heavy riders, which many other electric scooters in the space currently never consider. The Glider also sports oversized pneumatic tires, which roll over bumps and potholes easier than smaller wheels and help absorb bumps and holes in the road. 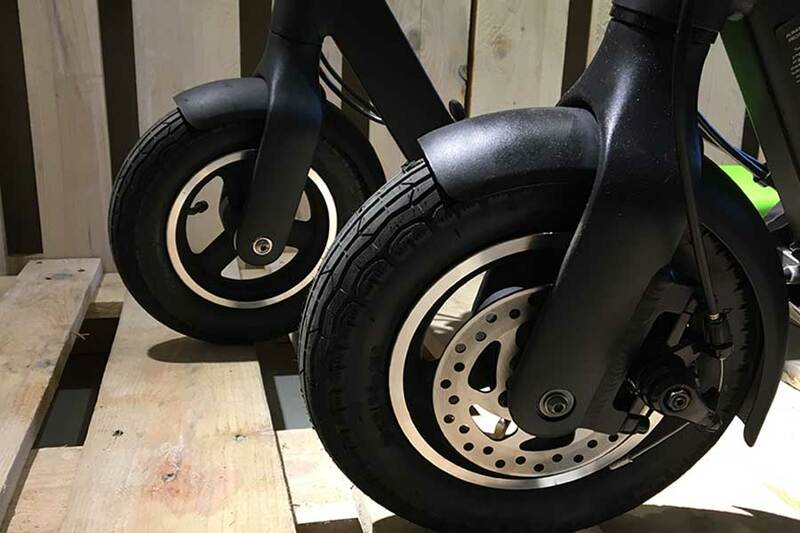 But to add an even smoother ride, Inboard has included coilover suspension in the design – another feature rarely found in electric scooters. 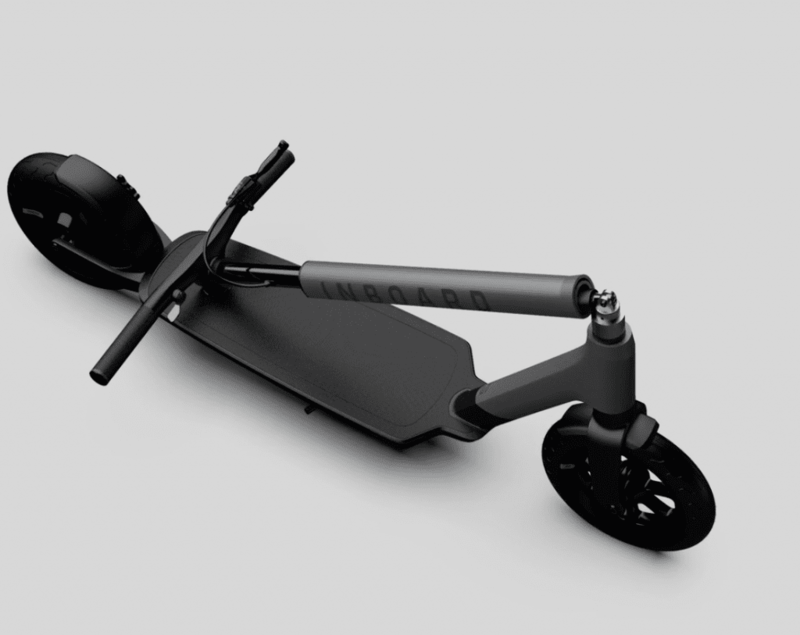 Inboard is offering both a consumer model electric scooter and a fleet version for companies. 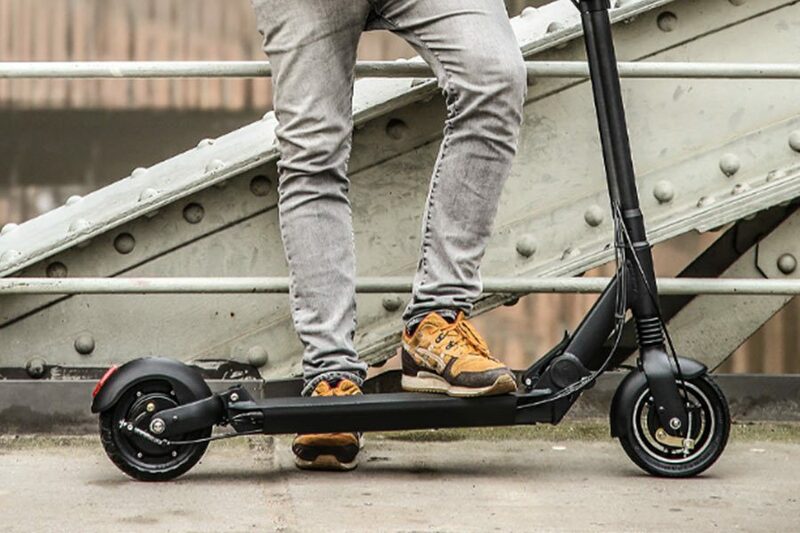 Inboard say that the Glider can connect to any network, so they’re catering to businesses looking to offer scooter rentals and people wanting to build apps and fleets of scooters. They have also built an open API which will allow developers to build their own apps – the possibilities really are endless. The Inboard Glider is set to be one of the smartest electric scooters released in 2019 and we couldn’t be more excited about it! The ZERO series represents a simple yet powerful message: ZERO Emissions. 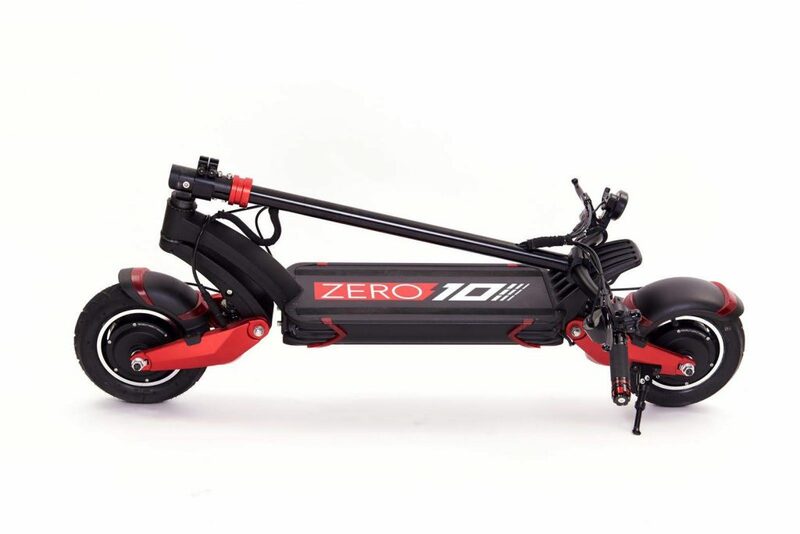 With a budget to match that simplicity, the ZERO electric scooters follow a signature black, white and red color theme, and their design is as eye-catching as they are impressive in performance. 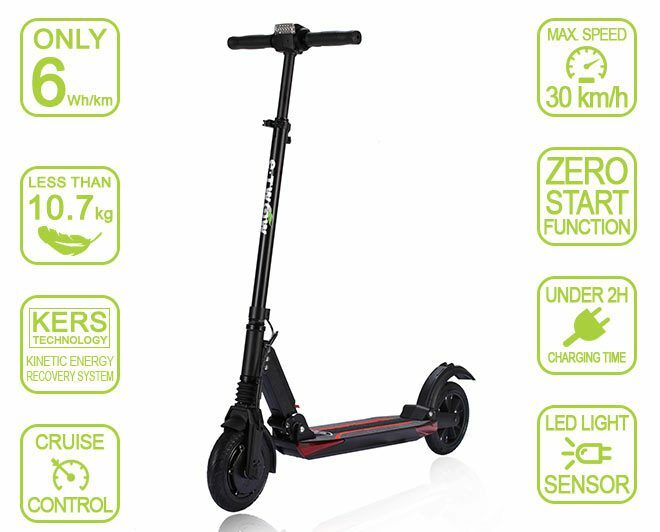 An entry-level high-performance e-scooter that rivals any other e-scooter in the market in the sub-£700 price bracket. It’s got all the basic bells and whistles a beginner rider would need in an e-scooter. With dual suspension, a 35-45km range and a powerful 48V 500W motor, there is no other electric scooter in the market that gives you more bang for your buck. How does it compare to its closest competitor, the Speedway mini 4 PRO? The ZERO 8 is very similar in terms of performance with the Speedway mini PRO, at a much lower price. Both are 48V drive train systems with 500W of power. Ride comfort is very similar. Both have front air tires and front spring suspension. However, the ZERO 8 uses a pair of air shocks for its rear suspension instead of the Speedway’s double spring suspension. This suspension is absolutely necessary due to the solid rubber tires on both these e-scooters which would make the ride extremely bumpy without the rear suspension. The ZERO 8’s air shocks trump the Speedway’s rear springs in terms of look and functionality, providing a softer cushion for every bump. Both e-scooters are equipped with single rear drum e-brakes as their braking mechanism. The ZERO 9 is basically an amped-up ZERO 8 with a higher power output (25A controller), air tires front and rear to provide more ride comfort and double brakes (rear drum brakes and front disc brake). With a range of up to 45km per charge, this e-scooter is a great choice for riders who need to go the distance but still want something compact. Whether you commute directly from home to work everyday or work as a delivery rider, the ZERO 9 will guarantee you a comfortable ride throughout your long journey. How does the ZERO 9 compare to equivalent models like the Inokim Light 2? On the design and weight scale, the Inokim Light 2 beats out anything in the market. Although similar in size and compactness, the Light 2 is comparatively more portable at 13kg while the ZERO 9 weighs considerably more at 18kg. When comparing performance, the ZERO 9 stands a head above the Light 2. Whether it is torque and power (500W vs 350W), top speed (40kmh vs 35kmh) or ride comfort (dual suspension on the ZERO 9 vs none on the Inokim Light 2), there isn’t anything in the market like the ZERO 9. Both e-scooter models are equipped with front and rear air tires for added comfort. The Light uses dual drum brakes as opposed to the ZERO 9’s front disc and rear drum brake system. 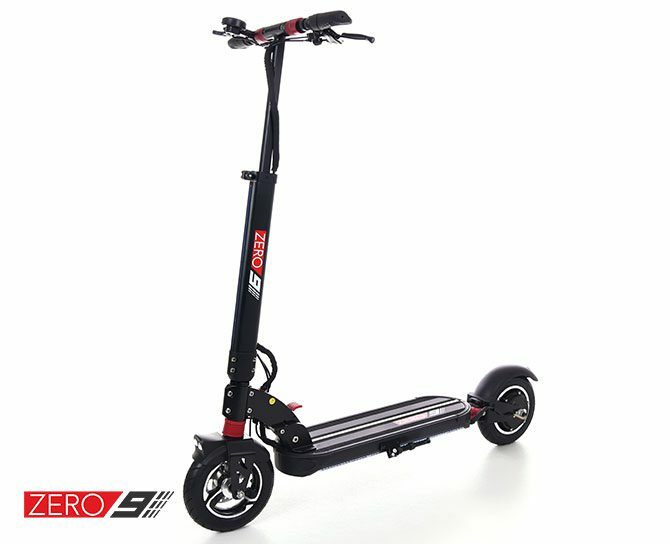 The highest performance and fiercest e-scooter in the ZERO series with dual spring shocks, dual 800W motor (for a peak power of 3200W on max load) and a whole lot of beautiful design features. This is not an electric scooter for the faint-hearted. Engage the dual motor mode and you will feel like you are in a drag race. The ZERO 10X’s instant acceleration can be felt as soon as you press down the throttle. 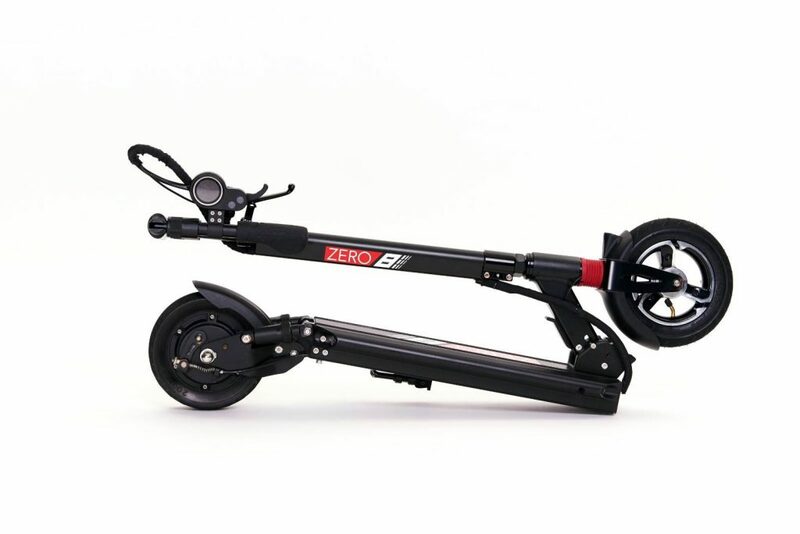 The ZERO e-scooter series is now available on pre-order with limited units available, please don’t’ hesitate in contacting us for more information. Storing or using electric scooters during winter. 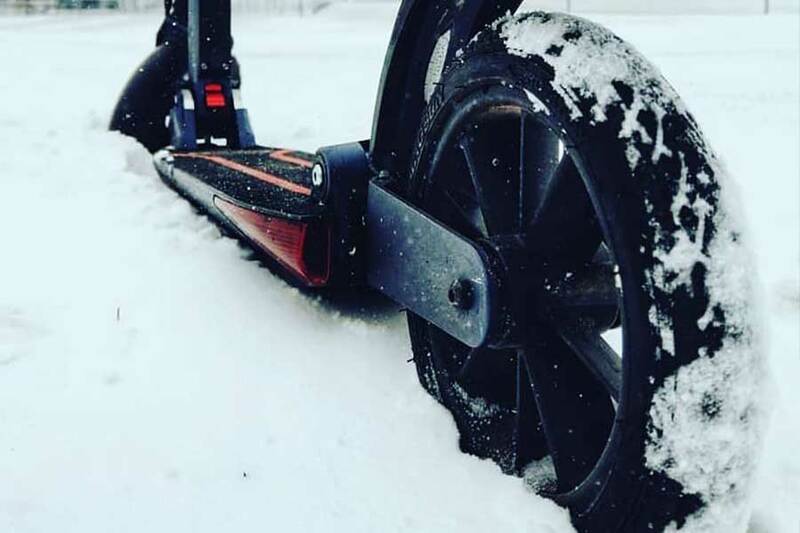 When the scooter is being used in winter, the battery must not get into contact with water, humidity, sand and / or salt (when the streets are sanded). The scooter needs to be cleaned with a soft piece of dry cloth after every ride. Low temperatures cause a reduced performance. To make sure, your driving pleasure continues next spring, we have compiled an overview of what to keep in mind when storing or using scooters during winter. As with all battery-equipped devices, the battery requires a little attention to get through the cold time of the year. An incorrect storage or an extended period without charging the battery can cause an irreparable depth discharge. This is not a warranty case. Following the winter break, the scooter is best handled like a new vehicle. Prior to the first ride, all security-relevant features need to be checked (brakes, lights, folding mechanisms, etc.). The battery needs to be fully charged and then once completely driven empty. It might happen that the state of charge is not correctly indicated – this will settle due to this procedure. Egret-TEN V2 vs Egret-TEN what’s new? The EGRET-TEN V2 is the latest model from Egret but what are the differences to the predecessor EGRET-TEN? We compare both scooters to give you a detailed overview. Of course, the two look very similar to the usual elegant design and the 10 ” pneumatic tires. So let’s take a closer look! The new geared motor of the EGRET-TEN V2 has an even higher torque than the engine of its predecessor. It accelerates much faster and slightly louder than the EGRET-TEN, the new model manages almost every gradient without manual assistance. 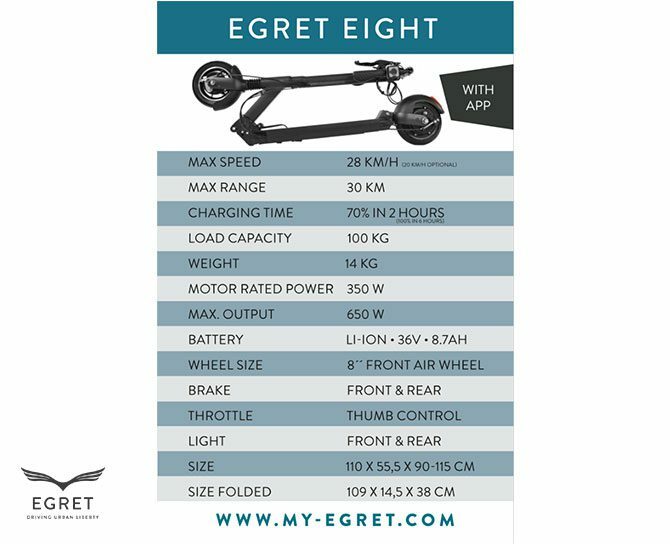 The EGRET-TEN V2 can now travel up to 42 km on one charge with a top speed of 30 km / h. The EGRET-TEN managed 35 km / h, but the maximum range is 35 km. 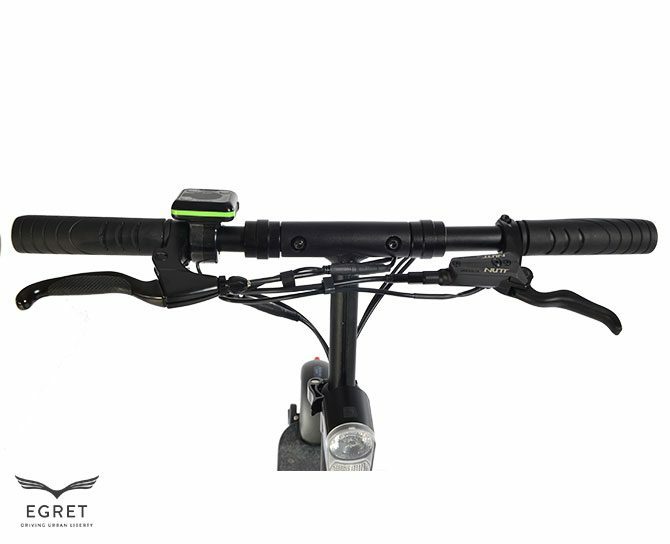 The new handlebar construction of the EGRET-TEN V2 makes it easy to adjust and additionally optimizes stability. 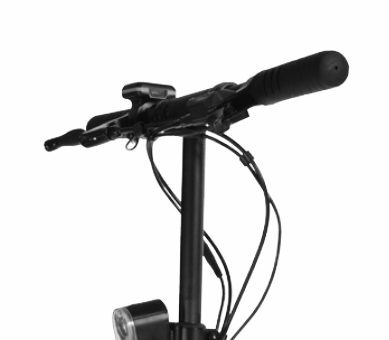 In addition, a bayonet lock in the folding mechanism as standard, this prevents the wrong folding and folding of the scooter by the user and locks the mechanism in its position. 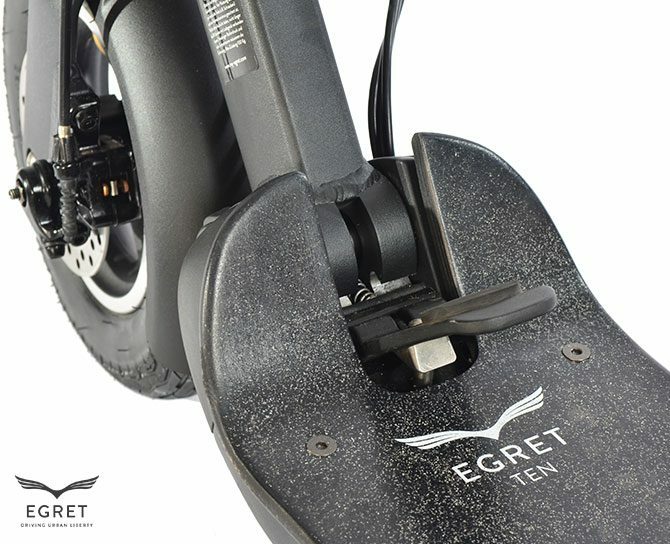 The EGRET-TEN V2 is equipped with a compact display on the handlebar and a new integrated throttle grip. This model now has a thumb throttle grip so both brakes can be applied simultaneously while driving. Five speeds limits can be adjusted with the new contoller. The mobile phone can also be charged via a USB port on the new display. The rear light can also be switched on and off directly from the display. 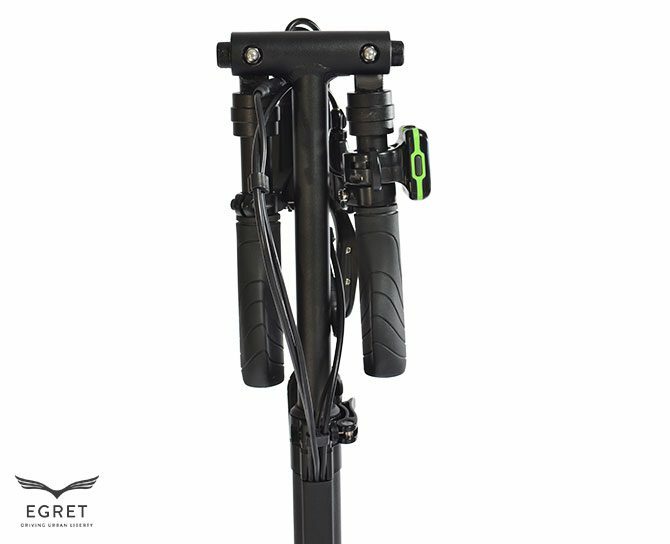 The EGRET-TEN V2 has a newly designed side stand, which now folds automatically. If the folding of the stand is forgotten, it automatically returns to its position. This increases safety and minimizes service cases. The charger for the EGRET-TEN V2 is not technically different from its predecessor and is compatible. However, we have supplemented the three-pin connector with a fourth pole. This prevents the breaking off of the poles by the inaccurate insertion of the charging connector. It uses the same 48V and 11.6AH battery on both EGRET-TEN models because it has proven itself over the years as a reliable source of POWER!!! 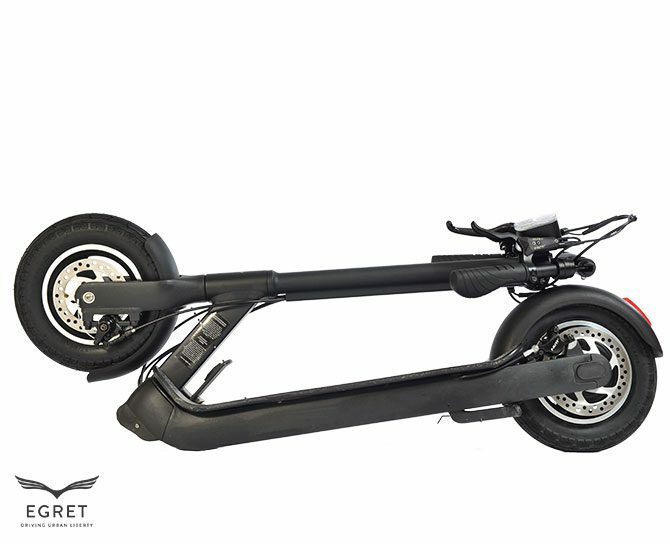 The Egret TEN, for those who don’t know it, is the “Mercedes” of electric scooters. It has all or almost all: Big wheels inflated in 10 inches for perfect comfort on any surface: with it, even the paving stones disappear. The sober elegance of the brand: A wide wooden stand board dyed on a structure in matt black aluminum alloy. An astonishing compactness for a scooter with large wheels, folded it hardly take more room than the Etwow Scooters. A 42km range on one charge and a speed that can reach up to 35km/h. To take advantage of all these advantages, it is necessary to make a small concession to the portability with a weight of 17kg. So what else you might ask? The new version of the EGRET TEN V2 electric scooter will now feature two disc brakes, front and rear, the cherry on the cake, it is hydraulic at the rear for more precise braking, both more efficient and softer. The other advantage and not least of this type of brakes is that it no longer needs any adjustments. To integrate this second brake handle and remains easily accessible, Egret abandons the trigger at the index finger for a new accelerator with the thumb. The same type as the version Egret GT which also has two brakes. We will also appreciate his new engine: With 60% more torque, it will delight people who seek a more sporty driving and further improve its behavior even on harsh hills. The Egret TEN will be connected: An application will be available on your smartphone. Its features have not yet been revealed, but it is hoped that it will include a long-awaited anti-start system. We also note a few small optimizations such as a stand with automatic folding by spring to avoid forgetting and breaking or a new system of a hook for its lighting. Talking of accessories, the Egret basket will be compatible with the handlebar of the egret Ten and it will have its own carrying bag coming soon. 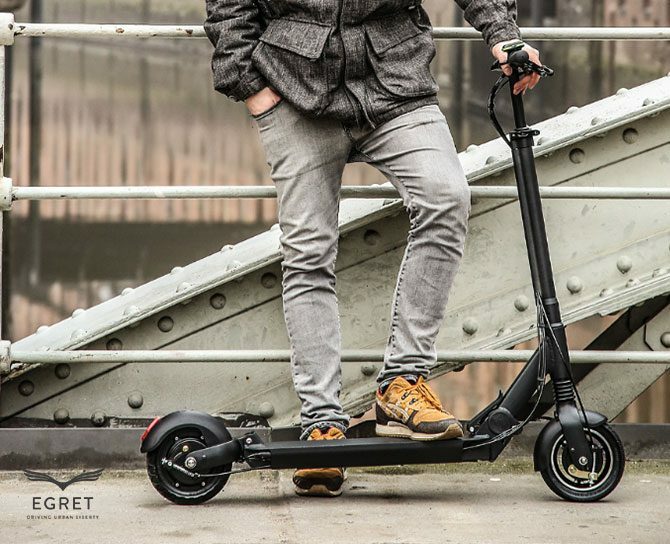 In its range, Egret has two 6-inch urban scooters and a 10-inch ultra-comfortable scooter. 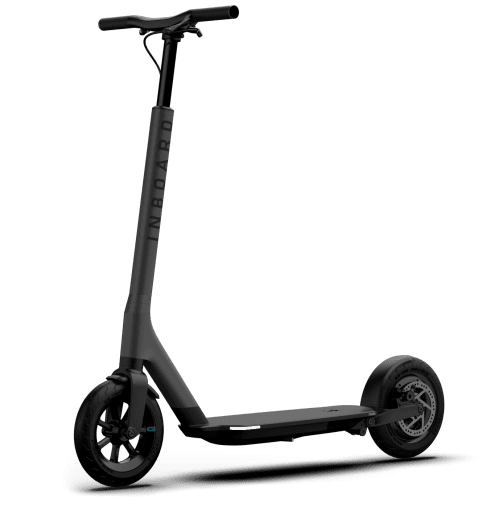 It is quite natural that the brand has decided to complete its offer with an 8-inch scooter so it comes to fight on the grounds of Inokim, Etwow … This intermediate version, the Egret Eight, comes with a front inflatable wheel, shock absorbers front and rear springs for comfort. In terms of features, the new urban electric scooter will have up to 30km of range (36V 8.7Ah) and a speed that will reach 28Km/h on a total weight of 14Kg. Braking will be similar to that of the Egret One GT with has two front and rear drum brakes. We find the large rear mud guard type Egret Ten with integrated lighting great in terms of comfort on rainy days. The display and throttle control will be identical to its big brother the EGRET TEN V2. With the egret TEN V2 and the Egret Eight, the Germans make it clear that it has heard the dreams of its customers! its evolutions reinforce the EGRET in its position of a high-end e-scooter brand. LIMITED TIME ONLY: £50 discount (plus FREE delivery) when buying an electric foldable scooter in our store! Simply enter the coupon code: S1C007er at checkout. Walk, cycle, bus, tube, tram, boat, e-unicycle, e-scooters, e-bike… However you like to travel, leave your car at home and take to the streets. As well as cutting down the amount of pollution you make, you can get some exercise, check out that new deli you’ve been meaning to pop into, or even meet a friend for a catch-up on the way home. What is air pollution made up from? Air pollution comes from a range of sources, including some nearby, like vehicles, other sources throughout the city, and some further afield. The proportion of pollution that reaches us from each source depends on the weather, the location, the time of day, and a number of other factors. Wherever you are, you’ll breathe in some of this pollution. The main pollutants are carbon monoxide, nitrogen dioxide, ground level ozone, particulates, sulphur dioxide, hydrocarbons and lead. Each one comes from a different source, has different effects on our health, and different chemical behaviours, which is why it’s hard to understand and control air pollution. How can I get warnings when there are periods of high pollution? Air pollution forecasts and alerts are available for the whole of the UK from Defra. Sign up to get daily pollution forecasts for London here or to just receive alerts on high pollution days click here. You can also get warnings on your iPhone by subscribing to the ‘At-risk’ group in this app, which will help you plan the best route through London to minimise air pollution exposure. There are also some easy ways to use your car less, like car-sharing or working from home one day a week. And they quickly become part of your routine. Just swap face-to-face meetings for video conferencing, and sitting on your own in traffic for chatting to your colleagues about what Steve in accounts has been up to recently. Plus you can have a lie-in, pick up the kids from school, go for an early meal… and make the air cleaner for everyone. 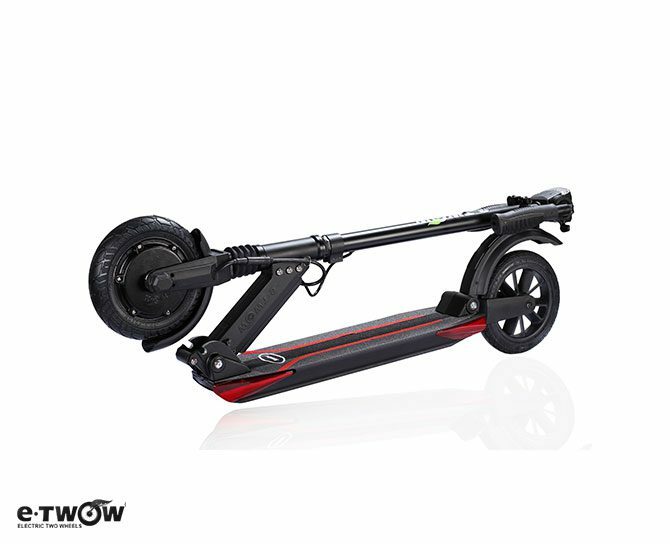 The E-twow electric scooter has it’s 5 years anniversary this year from the S1 series of scooters, then improved it to create the S2 model, now E-Twow took client’s suggestions and the latest legal provisions, and they present the S2 BOOSTER PLUS model! The new BOOSTER PLUS is a new and improved version of the S2 Booster, which comes to make the E-twow rides even smoother and safer. The BOOSTER PLUS was designed around the new controller, which has an updated control unit that allows for the Booster Plus to accelerate smoother and braking stronger in a shorter distance. 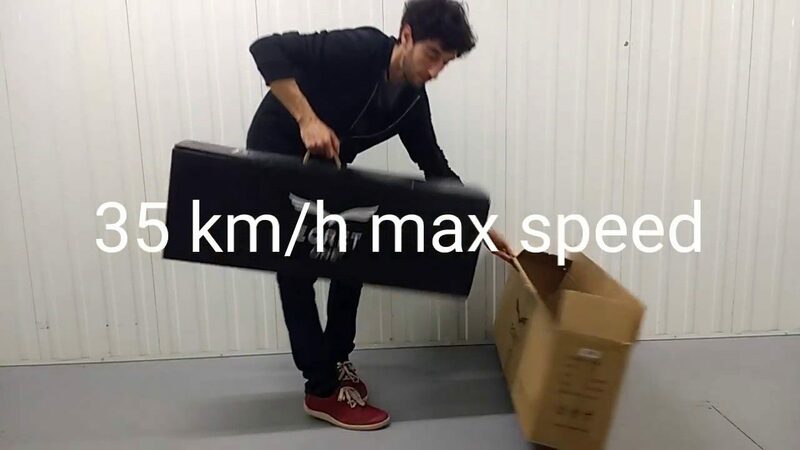 So, when the accelerator is pushed, no matter if it is pushed all the way, the acceleration will go slowly to the maximum speed, not sudden as the normal Booster. The maximum speed is still 30 km/h, the torque still 15 Nm. With a design modification, the new controller support solves the wire abrasion issue and allows for the controller to be easily mounted. The BOOSTER PLUS comes with a new type of display. The aesthetics and the software are updated. The display features a new colored appearance and the software allows the battery level to be more accurate. Also, the new display allows for the speed and cruise control settings to be easily set. (refer to manual enclosed). The rear wheel of the BOOSTER PLUS is now more flexible, offering a better adherence and a smoother ride. It is airless but has multiple layers of rubber that allow for the wheel to be softer and stronger. The BOOSTER PLUS comes with a new charger and an improved charging port, that is not only waterproof but also allows the charger to be inserted in a simpler and safer method protecting the charging pins. The BOOSTER PLUS features 4 side reflectors, 2 on each side and 2 at the back, easier to spot in traffic. The platform becomes thicker in order to accommodate the side reflectors. The motor cables have a new binding system so that it looks better and also protects the cables from being damaged. Depending on riding style, route and range there are 3 options at the moment. 36V 7.5Ah Booster S: The extra capacity gives you 5km more range, *30km in total. Max speed 33kph but more voltage means more torque. Perfect for riders over 80kg or hilly commuting journeys. 36V 10.5Ah Booster V: 5th-anniversary celebration, *38km range up to 38kph. maximum torque option for demanding routes. *Real range in our test, 70kg rider, summer. Don’t hesitate to contact us for more information about the different product options or which one is the right one for your journey. 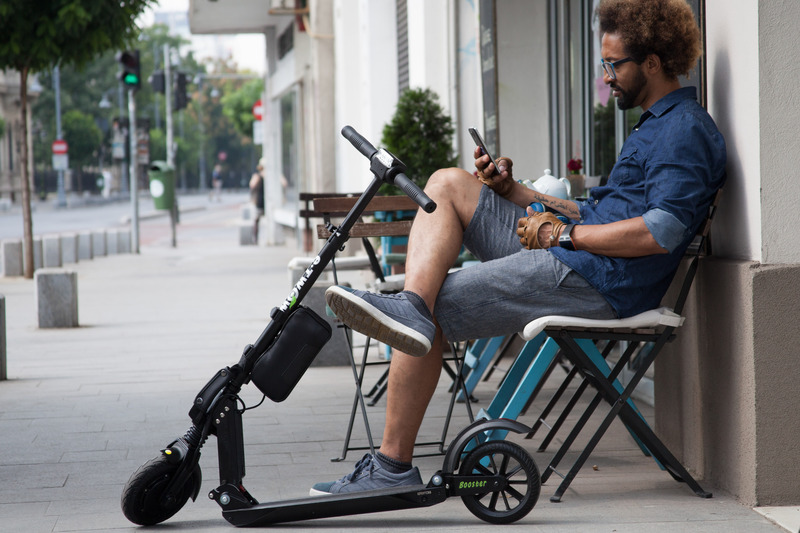 Vodafone Germany announced a partnership with Egret Scooters by Walberg Urban Electrics to launch a connected scooter. The ElektroRoller2Go will target the vehicle sharing market, with the Vodafone Sim allowing users to locate a free scooter with a smartphone app. The foldable scooter is similar to an electric bike and able to travel up to 22 miles on a single charge. The big advantage of the Electric Scooters compared to all other common vehicles is its portability. Without taking more space than a sports bag you can simply fold the scooter and take it with anywhere. The EGRET scooters are not only an alternative to public transport but also the perfect complement. Another advantage of the e-scooter2Go program is to make cities become cleaner. Instead of using your own car every time for inner city short journeys and eternal traffic lights, you can simply swing to the next emission-free electric rocker. This is better for the environment and makes your trip even more fun. The telecommunication partner wants to equip the scooters with Sim cards to network them. “We want to network everything that has wheels,” said Vodafone boss Hannes Ametsreiter then, you start the app, look for a scooter in your area, use the app to switch on the scooter and enter your target point. The electric scooter can drive up to 21 miles before it has to be recharged and with speeds up to 20 mph gives you plenty of fun and convenient transportation A to B.
Congratulations to the team @ Egret for this extraordinary achievement.